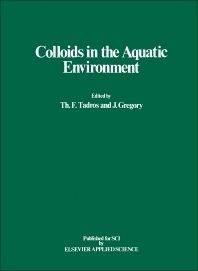 Colloids in the Aquatic Environment covers the proceedings of the International Symposium by the same title, held at the University College London on September 7-9, 1992, organized by the SCI Colloid and Surface Chemistry Group. This book is divided into 20 chapters and begins with an introduction to the fundamentals of surface structure and reactivity. The succeeding chapters deal with molecular mass determination of humic substances from natural waters, the biospecific mechanism of double layer formation, the dynamics of colloid deposition in porous media, and the evaluation of surface area and size distributions of soil particles. These topics are followed by discussions of the transport and capture of colloids; colloidal stability of natural organic matter; the hydrolytic precipitation and modeling ion binding by humic acids; and the thermodynamic aspects and photoelectrophoresis of colloids. Other chapters explore the colloidal transfer in several aquatic environments. The final chapters consider the mechanism of colloid detachment, speciation, partitioning, and stability. These chapters also look into a hybrid equilibrium model of solute transport in porous media in the presence of colloids. This book will be of great value to civil and environmental engineers.